The Holy Spirit is the One who anoints people whom God calls to be set aside for ministry. Originally, sacred oil was poured over, or rubbed on, a person's head to consecrate him or her for ministry. Today the Holy Spirit anoints people through His presence and power in their lives, thus preparing them for the ministry to which God has called them. Jesus Christ is the promised and anointed Messiah. "Jesus" is His Name which means "Yahweh is salvation." "Christ" is His title, which means "Anointed One." "Isaiah 61" outlines the Anointed One's "job description. "He will preach good tidings to the poor, heal the brokenhearted, proclaim liberty to the captives, set free those who are bound in their prisons, proclaim the Lord's coming, comfort all who mourn, give hope and joy, set people free to praise God as His righteous people, and baptize them with the Holy Spirit (Matthew 3:11). Just as the Holy Spirit equipped Jesus for such a wonderful ministry, He wants to anoint us as "trees of righteousness," called by Jesus to share in the same ministry. 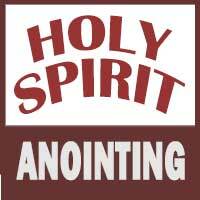 Holy Spirit, please anoint me for service and prepare me to share Jesus' ministry as a servant of our God.